Foredown Tower is a great example of an imaginative new role that a building can play once it is no longer needed for its intended purpose and is well worth a visit on a clear day. Foredown Hospital was built in 1883 up on the Downs on the site that is now occupied by Crest Way in Portslade. 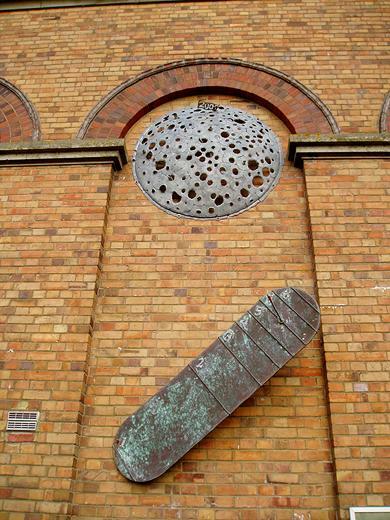 The handsome brick and flint building opened as an isolation unit for treating infectious patients with illnesses such as scarlet fever, diphtheria, tuberculosis and typhoid. It was approached by a long country track in the Victorian tradition of placing such patients as far away from any other development as possible. It 1913 it became ‘Hove Borough Sanatorium, Portslade’. The building luckily escaped serious damage from two bombs that landed close (one a 500-pounder) during the Second World War, suffering just a few smashed windows. Unfortunately, the hospital didn’t have such a luck escape in 1988/9 when it was demolished for ‘development’ due to infectious diseases becoming less prevalent. Three important features were saved, namely some boundary walls, the water tower and a terracotta plaque bearing the date ‘AD 1883’ which is now set in a wall at Benfield Heights nearby. 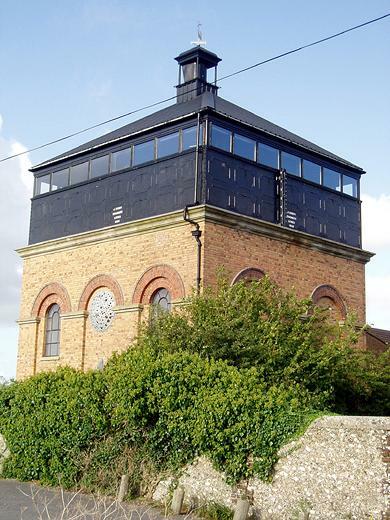 The tower, now known as Foredown Tower, was built in 1909 by J. Parsons & Sons with a 27,500 gallon tank made by Every’s of Lewes. The immense weight of the water and tank was supported by brick walls which are up to 33 inches thick in places. The original ballcock and water depth gauge have been preserved along with lots of the massive pipes that served the tower nearly one hundred years ago. After financial help from American Express and much deliberating, the tower opened in 1991 as the home of one of England’s only operational camera obscuras. Windows and a pitched roof were added above the tank to facilitate the camera which is built into a tower at the very top. It projects a television-like image onto a dish at floor level and can be pointed in any direction from the sea to Worthing to the Devil’s Dyke to Eastbourne. The view is spectacular. Call (01273) 292092 or go to www.virtualmuseum.info for details of opening hours. This situation is remarkably similar to the case of the ‘Pepper Pot’, the tower of a demolished building on Queen’s Park Road which currently stands covered in graffiti, awaiting a new use. Ideas anyone?